Metro this month is providing key details on plans to accelerate an important Measure R project for northern Los Angeles County. The project would add carpool lanes for 13.5 miles in both directions to Interstate 5 through the Santa Clarita area. A toll for vehicles with one or two occupants (at peak hours only for vehicles with two occupants) would be charged to use the lanes — with the tolls being used to finance the construction of the carpool lanes about 30 years earlier than planned in Metro's long-range plan. There's a lot more detail in the Q & A that follows in the post. 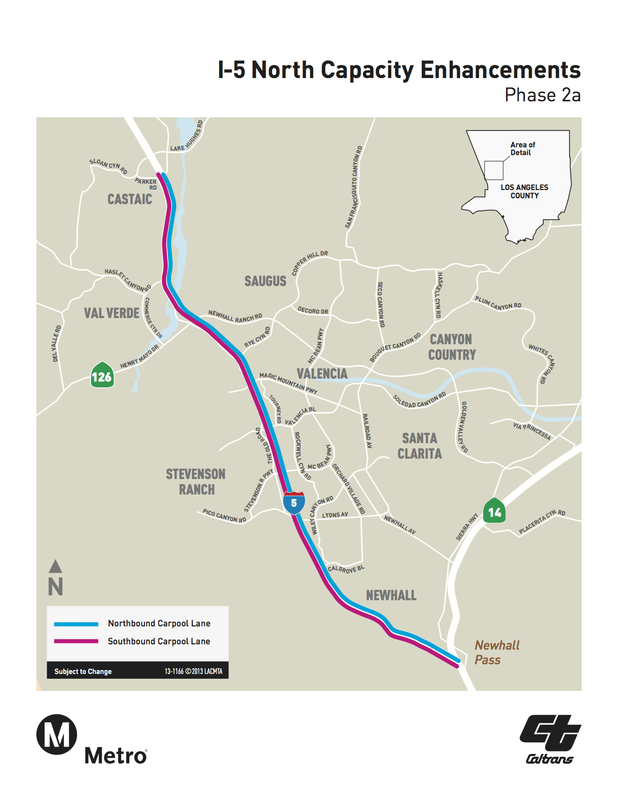 The absolute crucial details: the lanes would be managed to maintain speeds of at least 45 mph, the number of general traffic lanes would remain the same and the new lanes will add capacity to the freeway, especially when coupled with the new truck lanes being built on either side of the Newhall Pass. There are two community meetings scheduled this month to discuss the project. The public can ask questions and provide feedback. Content at all meetings will be identical; please attend the location most convenient for you. All meetings are open to the public and we urge you to invite your friends and neighbors. Below is the Q&A on the project with a lot more detail and there's a short Power Point on the project after the jump. I'm interested in your thoughts on the project, particularly if you live in Santa Clarita or elsewhere in northern L.A. County. What exactly is the project proposing to do? The project would use a public-private partnership to build one carpool/toll lane in each direction to the I-5 freeway for 13.5 miles between the 14 freeway and Parker Road. A private firm would be hired to help fund, build and manage the lanes and be paid back with toll revenue. That would allow the project to be completed by 2019 instead of 2040 or later. This stretch of freeway includes some of the fastest-growing areas in Southern California — the city of Santa Clarita has gone from 79,000 people in 1979 to more than 201,000 in 2012 and is expected to add 50,000 more people in the next 30 years, not including growth in the unincorporated parts of the Santa Clarita Valley. Not surprisingly, traffic congestion in the Santa Clarita Valley and surrounding areas has worsened; the average one-way commute time of 32.7 minutes for Santa Clarita residents is among the highest in Los Angeles County. The carpool/toll lane will be used for free by those in cars with three or more passengers. Buses, van pools and motorcycles would also use the lanes for free. Cars with two people will be able to use the lanes for free outside of peak hours — during peak hours they will be charged a toll. Single motorists will be charged a toll at all times. Tolls will change depending on the time of day and traffic; the exact amounts haven't been set yet. (On the Metro ExpressLanes, tolls currently range between 25 cents and $1.40 per mile). In exchange for the toll, the lanes are managed so that those who use the HOV lanes can expect speeds of 45 miles per hour or greater. Metro will also consider having lower tolls for qualified low-income users. Similar lanes have opened in recent years around the U.S. and are known as congestion pricing or HOT lanes. The idea is to sell extra space in the carpool lanes to better spread out traffic on the freeway and increase its capacity. In other similar projects, traffic has also improved in the regular lanes as some motorists choose to move to the carpool/toll lanes. What is a benefit of paying the toll? In short, less time driving and commuting — whether in a car or on transit. Motorists using the entire 13.5 miles of HOT lanes should be able to make the drive in a maximum of 19 minutes — a considerable time savings over peak period travel times on that stretch of the 5 freeway. Vehicles using the new lanes should expect to use less gas than in stop-and-start traffic and therefore help improve air quality. Trucks will not be allowed to use the lanes. The lanes will also be used by vanpools, Santa Clarita Transit and Commuter Express buses, helping transit users get to and from the Santa Clarita Valley more quickly. What happens to the general lanes on the 5? All the regular lanes that can currently be used for free will remain — no general lanes are being taken away as part of the project. The regular lanes are also going to be repaved as part of the project. The toll lanes are also expected to ease congestion in the general lanes and motorists in those lanes may see some gas savings. There's another big benefit for motorists using the regular lanes. The project is presently building truck-only lanes for big rigs slowly climbing and descending Newhall Pass. Those trucks often tie up traffic on the 5 as faster-moving car traffic gets stuck behind trucks or has to frequently switch lanes to pass the trucks. The southbound truck lane will be between Pico Canyon Road and the 14 while the northbound lane will be between the 14 and Calgrove Boulevard. The $72-million truck lane project is scheduled to be completed in 2014. Why is Metro building carpool lanes that can be used for free in some parts of Los Angeles County while proposing tolled lanes for the Santa Clarita area? Toll lanes are the best way to speed up the construction of this particular project, which isn't scheduled to be fully complete until 2040 — and that's only if extra funds can be found to supplement money from the Measure R sales tax increase approved by Los Angeles County voters in 2008. Without the toll lanes, the alternative is to try to build the project in shorter segments over the next 20 to 30 years, meaning there could be chronic construction on this stretch of the 5 for the next two-plus decades. Building the lanes now also means that area residents can enjoy the benefits of them now instead of many years in the future. Metro also believes the project will be considerably less expensive to build now while construction costs remain low due to the Great Recession. The project will also help retain or create jobs in the area. Why won't the toll lanes continue south of the 14 freeway? At this point, the carpool lanes on freeways immediately south of the Santa Clarita Valley are either existing or have funding and are being designed or under construction. Those lanes will allow motorists who use the new North County toll lanes on the 5 freeway to continue south on carpool lanes on the 5 and 405 freeways; in the case of the 405, the carpool lanes will extend in both directions all the way to the Orange County line. Whether other carpool lanes remain free in the future is something that could change if there is both public and political support for trying to manage regional freeways in a different manner to combat congestion. To re-emphasize the point: the reason that tolls are being sought on this 13.5-mile stretch of the 5 freeway is that it's the best way to finish the project by 2019. Is this an expansion of the ExpressLanes that recently opened on the 110 freeway? The idea behind the ExpressLanes on the 10 and 110 is the same as the idea here: sell extra space in the carpool lanes to help increase the freeway's overall capacity. Technically speaking, however, these are not an expansion of the ExpressLanes, which are part of a one-year test program that is largely funded by the federal government. This project is different. A private firm would pay for the construction and then be repaid by tolls once the lanes open. This kind of arrangement, called a public-private partnership, is similar to a mortgage. Metro is getting the money up front to build the project and then will use toll revenues to repay the cost of the project over the next 35 years. Once the 35 years are complete, Caltrans — the state agency that oversees freeways — could choose to manage the lanes itself or have a private firm continue to manage them. Why should Santa Clarita residents pay for a project that also includes freeway sound walls in Pasadena and Arcadia and extra lanes for a short stretch of the 71 freeway in Pomona? It's a funding issue. All of the projects are presently ready to be built — most of the planning and environmental studies are complete. But the best way to build all of them is to pool the available funding for them from a variety of sources and have a single contractor build them. The larger the project, the more likely it will attract contractors who may be able to keep the price down of building them. Why will only carpools of three or more people be allowed to use the lanes for free? It's the best way to increase the capacity of the lanes — the more people per car, the more people the lanes can carry. Offering free rides to vehicles with three-plus occupants is also the best way to ensure enough money is raised to build the lanes now. What happens when you've repaid the cost of the lanes? Caltrans will own and manage the facility or could choose to have a private firm continue to manage it. What an act!! How soon will the HOV be converted to an HOV/HOT and then to ExpressLanes? Whoops they forgot to call I-5 Expansion HOV as HOV/HOT since the 110/10 ExpressLanes are only Pilot Projects and have not been certified as justice and profitable…. They should also build HOV/HOT Lanes on the 101 In the San Fernando Valley and add at least one new main lane in each direction. Gee, Clyde. We know the new transponders are… ahem.. lacking. They don’t work throughout the whole state, they don’t tell you how much you have available in your account, they presume commuters would be their only users. Got it. Nevertheless, toll roads are back and they pay for other projects along with themselves. The tax base is too low in California, thanks to the horror of Prop 13, and raising new taxes is almost impossible. Metro and CalTrans didn’t create the problem: they just have to solve it and pay for it. In other states, toll roads have been the norm for a long time. Which roads get plowed first, have their own towing services and service plazas? The ones that charge for the features. Do you think you’re being swindled? It’s the Newhall Pass, part of a chain of mountains too new for a glacier to wear them down. People built suburbs in them. Smart? Not really. Putting the Disneyland for the Valley in there and place the only road to the Central Valley farmlands in the middle? Yup, traffic. During the next couple decades, we have to build the replacement transit systems for a state that really likes cars but now realizes they’re exhausting. We have to perform huge amounts of maintenance on what exists. If you want an idea how broke the state is, take a look at all the original button-copy signs on the freeway. Compare that to anywhere with real weather — those signs would have rusted away a couple decades ago. I just received a huge property tax increase and now this. Goodbye California!! They should convert existing carpool lanes on the I-105 into HOT Lanes. Best idea ever. Bring on the tolls! There is already construction in the I-5 median between SR-14 and Lyons; is it only for the truck lanes mentioned? Is there space there for both truck lanes and HOT lanes? I’d like to see the financial modelling for the P3. The only significant congestion (except for after accidents) is south of Lyons, so toll revenue north of Lyons would be minimal. @Brian – go for it. Your most powerful vote is with your feet – where you choose to live. Don’t build these lanes. I pay out every time I shop in Santa Clarita, but my money is shipped out to projects in other parts of the County. If you can’t build it with existing taxes then don’t build them at all. I would rather wait until there is funding to pay for the lanes. Why does the rest of County get free lanes while we have to pay for them in Santa Clarita? How do we keep you out of Santa Clarita???? !!! will you tell us that at the meetings? are you going to mention all the following facts too? Did you know these FasTrak facts? 4. If you do not use the ExpressLanes at least 4 times a month you will be charged an ADDITIONAL $3 per month for account maintenance. 5.The toll prices and rules regarding solo versus HOV-use change minute by minute and are a distraction to drivers who should be focusing on driving safely. Instead they will be reading and trying to interpret signs and potentially making dangerous last minute lane changes to avoid tolls and/or violations. There has been insufficient awareness of the need for transponders in EVERY vehicle. This unfairly discriminates against drivers of children who travel as a carpool 100% of the time and thought that because they didn’t have to pay that they didn’t need to register for FasTrak. These “unknowing offenders” will be mailed violations up to $400.00 weeks or months later despite the fact that they were not required to pay a toll due to HOV status. This will have a severe financial impact on families where one parent stays home to raise the child(ren) in lieu of an income. People in Los Angeles have been using these FREEways for years with the dedicated HOV/carpool lanes. Changing their daily routines and routes and forcing people to pay even if they will never use the lanes under toll conditions is WRONG.